How do you shop zero waste? Share your Zero Waste Shopping Challenge photos on social media by Earth Day (April 22) using the hashtag #MMZeroWasteChallenge for your chance to win a reusable water bottle, shopping bag, or lunch container. Winners will be randomly chosen from those who use the hashtag. I knew I would be chronicling my failures along this journey, I just didn’t know I would have to do it so soon! 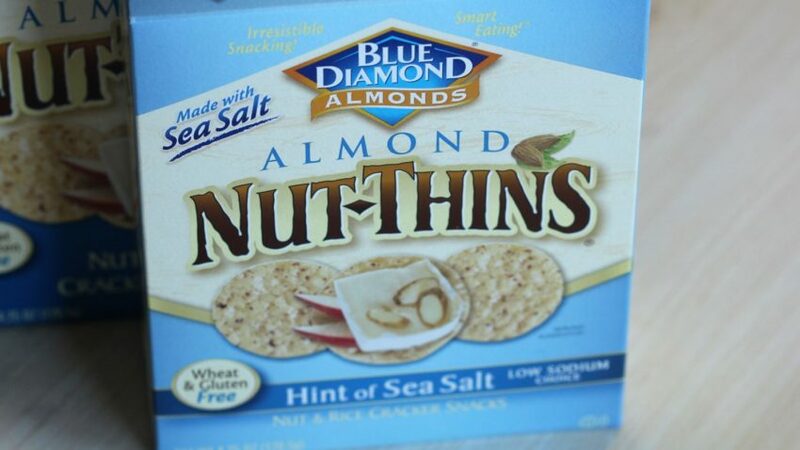 How was I to know that the co-op was putting my favorite crackers – Blue Diamond nut thins – on sale starting April 3rd! I did not have the willpower to pass them up, so bought a supply to fill my cupboard. The cardboard boxes can be recycled, but the inner bags? Not so much. I checked on the Blue Diamond website and found much useful information, including the fact that the inner bag is made of foil sandwiched between thin layers of plastic and must go into the trash. Last Thursday, I arrived at work with a thermos of tea and my insulated lunch bag. I set the tea on my desk and reached in the bag for my breakfast, a container of delicious homemade 7-grain cereal with golden raisins, walnuts, and a touch of brown sugar. Oh no! I realized I left my oatmeal sitting on the counter at home, meaning breakfast was no longer going to be “package-free”. I grabbed a bagel from the co-op’s bakery case, and even though it was on a tray, I knew it had arrived at the store in a plastic bag. And a little single-serve Organic Valley cream cheese was just too tempting to pass up. Guess what? Those containers that the cream cheese come packaged in are “made of high-impact polystyrene” and can be recycled. I looked it up. Later in the week, I invited my daughter and granddaughter over for dinner. The steak I bought came packaged on a tray wrapped in plastic, both of which had to be thrown away and will end up in a landfill. And my baguette came in a paper bag, which I was able to recycle. Other than those transgressions, I did pretty good during the first week of our Zero Waste Shopping Challenge. But I am running low on cheese and I’m heading out of town for meetings this week. I am not sure how I will account for all of those hotel buffets. Wish me luck!